Alc. 5.0% Vol. Pale Ale. A Pale Ale with a dry bitter finish. Pacific Gem and Centennial hops give a refreshing lemon citrus flavour and aroma. A robust and fruity Porter. Heavily hopped with Bramling Cross and Brewers Gold, it has a flavour and aroma which remind you of dark fruits such as black cherries and blackcurrants. The rich mix of chocolate, black and crystal malts ensure that the taste of the hops are enhanced by a contrasting dark chocolate and roasted malt flavour. This beer is an India Pale Ale with a long bitter finish. Made with only Maris Otter malt, the strong grapefruit, orange and floral notes from Cascade, Amarillo and Chinook hops are allowed to shine through. 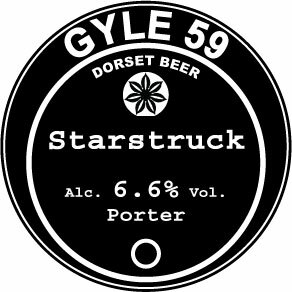 This is our porter, The Favourite, enhanced with a subtle addition of star anise. This addition gives the rich and fruity porter an extra complexity with a gentle hint of liquorice. This is a Ginger IPA. The beer has a subtle infusion of root ginger giving the IPA a refreshing and spicy addition to the citrus and floral taste and aroma provided by the hops. This is a Saison. It has its roots in a long tradition of Belgian farmhouse ales. The mixture of Pale and Vienna malts combine with three different English and German hops to perfectly compliment the earthy, peppery and spicy yeast flavours. Freedom Hiker is an amber ale based loosely on an 1800's recipe and brewed initially for the Tolpuddle Pilgrims, who in 2014 walked along the route taken by the Martyrs from Plymouth to Tolpuddle. As a nod towards the transportation of the Tolpuddle Martyrs to Australia a whole heap of Australian hops were included in the original recipe for additional flavour and aroma. A fruity and floral aroma is enhanced by coffee malt flavours and a long bitter finish. A refreshing drink for a weary pilgrim! This wheat beer has a depth of flavour to satisfy any wheat beer lover. A gentle fragrant spice addition from coriander seed combines beautifully with the rich fruity notes produced by the yeast and hops. Inspired by the International Nettle Eating Competition held at our local Bottle Inn, Marshwood, we decided to produce a nettle beer. The result is a refreshing IPA where citrus fruits and floral aroma and flavour combine with a hint of nettle and a long bitter finish. Brewed in collaboration with Abbotsbury Subtropical Gardens, to celebrate the gardens' 250th anniversary. We have included a subtle addition of Drimys Lanceolata, a plant grown at the gardens, to give this session ale an unusual twist. Drimys also known as mountain pepper brings a refreshing edge to the beer and a gentle warmth in the aftertaste. A beer that improves over time. A robust and fruity IPA which develops in complexity and richness with age, or simply enjoy it now! Pale and interesting! A smooth wheat beer with a silky mouthfeel underpinning tropical fruit flavours and aromas. A long bitter finish with notes of grapefruit pith and spice. Light, refreshing and full of fruit and citrus flavours. An extremely satisfying session IPA. A triumph in balancingflavour, body, aroma and mouthfeel - and all at 2.5%! Brewed for The Queens Arms, Corton Denham to celebrate the pub's 170th birthday, the Queen's 90th birthday. This beer is a Saison with a twist, combining the earthy, spicy, traditional Saison flavours with a punchy American citrusy zing. A robust and complex stout with the addition of hedgerow elderberries collected from around the brewery. The result is a morish warming beer reminiscent of burnt toast, jam and dark chocolate spread. Cask matured since October 2015. A refreshing citrusy session pale with Citra, Centennial, Bobek & Pacific Gem hops. Vienna lager, dry hopped, cold fermented and lagered for a minimum of 12 weeks. Honey on toast!